Los Pinos is one of the few properties in Breckenridge CO Real Estate that can boast they are walk to the slopes and walk to town accesible. Located a hundred yards or so from the Breckenridge Ski Resorts Snowflake Lift and four short blocks to Main Street Breckenridge, Los Pinos provides a location that is perfect for those who love to ski/board and those who love to shop. Los Pinos was built in 1997 with 43 units comprised of 2- studio deed restricted condos, 1 – studio, 2 – 1 bedrooms, 19 – 2 bedrooms, and 19 – 3 bedrooms ranging in size from 294 – 1444 square feet. All the condos at Los Pinos (except the studios) come with detached 1-car garages. After a long day enjoying all the summer or winter activities Breckenridge, CO has to offer relax in the common hot tub at Los Pinos. If you don’t want to meander down to the restaurants located on Breckenridge’s Main Street you can always take a short walk to Grand Timber Lodge and enjoy lunch, dinner or cocktails at the Lodgepole Bar & Grill. You can also walk to Beaver Run and enjoy dinner at Spencer’s Restaurant. 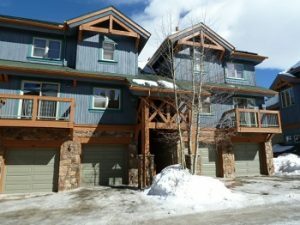 When searching for condos for sale in Breckenridge CO make sure you take a look at the condos for sale in Los Pinos. Considering Real Estate in Breckenridge contact us today to arrange a private tour of Los Pinos and other properties for sale in Breckenridge Real Estate.